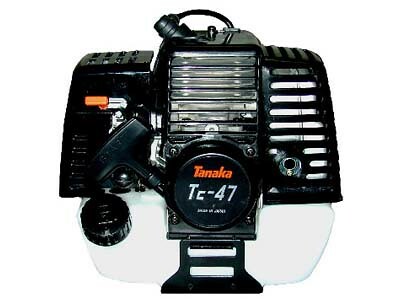 The Tanaka 47 is a 47cc 2 stroke engine. This engine can be bought through various power tool suppliers as well as from the factory itself. Prices seem to fluctuate between $250 and $350 depending on where you look. Since Tanaka is a power equipment manufacturer, engines and parts are easy to come by and will likely stay like that. This engine had minor performance problems related to its limited carburetor. On long, sustained strain, the engine would often bog slightly. This is one of the few performance concerns that were addressed with the introduction of the 47r. Tanaka designed a pipe specifically for its 47cc engines to be mounted on Bladez's and its own scooters. Bladez also designed this pipe to me mounted on its scooters along with this engine and the Tanaka Purefire 40. There are no head kits in production that are compatible with this engine. There are timing keys available to advance this engine's timing for a few more RPMs, but the effects these have on this engine have shown to be negligible.